Homeland Security Secretary Kirstjen Nielsen has ordered Federal Emergency Management Agency Administrator Brock Long to reimburse the government for improper personal use of official vehicles, which was uncovered in an investigation. But he won’t lose his job — at least for now. A report by the Department of Homeland Security’s Office of the Inspector General found that Long had used government vehicles for “non-official” reasons, as well as for traveling between his home in Hickory, North Carolina, and his office in Washington without authorization, according to a statement from Nielsen on Friday after she reviewed the findings. She did not detail the specifics of Long’s “non-official” use of government vehicles. The watchdog’s report had not been made public as of Friday night. Long has been under a cloud at the same time FEMA has been responding to the damage from Hurricane Florence in the Carolinas while also fending off attacks for the continuing problems in Puerto Rico in the wake Hurricane Maria more than a year ago. Long appeared on CBS last Sunday to defend Donald Trump after the president angrily derided estimates that nearly 3,000 people died as a result of Maria. Long was reportedly considering resigning just as Florence was bearing down on the East Coast on Sunday. He and Nielsen have had a long-simmering feud for over a year. But Long and Nielsen seemed to close ranks a bit as both characterized Long’s personal use of government vehicles as “mistakes” rather than an intentional unauthorized use of the vehicles. 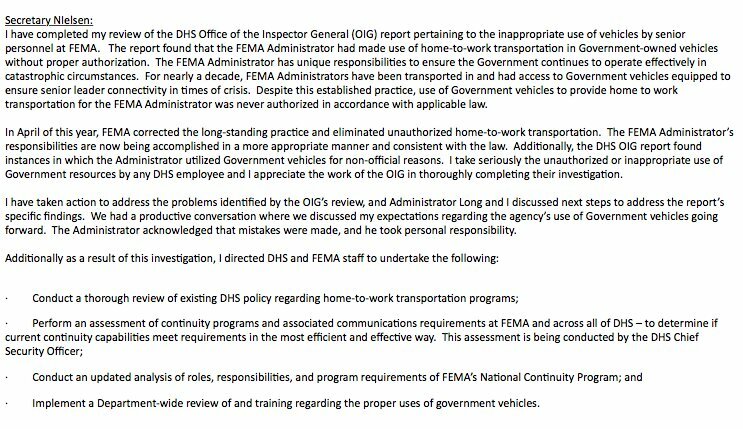 Nielsen said that she has directed Long to “reimburse the government, as appropriate, for any non-official use of government vehicles.” She also ordered him to review policies regarding how government vehicles are used by FEMA officials. There may still be other actions against Long. CBS News reported earlier this week that the inspector general’s findings had been turned over to prosecutors for consideration of possible criminal charges. The House Oversight Commission is also examining Long’s travel. He has until Oct. 1 to provide documents to the committee concerning travel and hotels possibly used by FEMA employees who accompanied him on the personal trips. Long, 43, took over as FEMA administrator over a year ago. Bad feelings between him and Nielsen — who was chief of staff at that time to then-Homeland Security Secretary John Kelly — reportedly began soon after he didn’t attend morning meetings with agency staff, The Washington Post reported. There’s also tension over Long’s potentially competing relationship with the president, according to the Post.